Nikon D3 any time soon now. The Nikon rumour mill is in full force with the prediction of a high MP 1.1x or 1.13x crop factor D3 being announced at PMA. We know that the D3h is overdue, but maybe they're swapping which comes out first this time? Or dropped the x/h separation? Check my post on flickr. Ken Black does 171' rally jump in his production class rally car. Shocking! 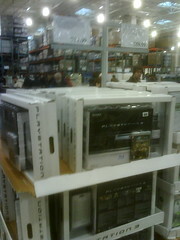 Costco got a crate full of PS3s less than two months after launch. It took them over 4 months to get a small number of XBOX 360s which sold out fast after that lunch. Not only that, but there is a stack of XBOX 360s right beside this PS3 stack, and it's got a few slots empty. Apparently I could make a lot of money off this. "Canada remains far behind virtually all of its peers in the industrialized world with respect to its efforts to bring its copyright laws up to date with the realities of the global digital networked environment," the group argued in its submission. What? What Peers are they talking about? The only country that has draconian copyright laws is the United States. Our governments job is not to protect outdated business models. Michael Geist has a great response to this article. Web 2.0 all over again. Nikon D200s or D300 DSLR coming soon? If you look at Nikons release dates for their DSLR line, you'll notice that they release a new or updated version of a body about every 18 months. OK, so it's not that clear that it's 18 months. In the D1x/h -> D2x/h it was several years jump. Same with D100 -> D200. But things have changed since back then. Is the D200s or D300 due out this Spring? Panasonic today announced the new DMC-TZ2 and DMC-TZ3. I have not used this camera. 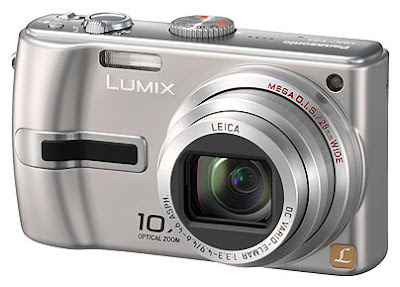 The fact that we have a camera this small, with a 10x optical zoom is amazing though. It's also got OIS, which is one of the only image stabilization systems that actually works in compacts (vs. Nikons VR and Canons IS which work fine in SLRs, but not compacts). This lens also starts at a 28mm equivalent field of view on 35mm which should be the new basis for compacts, not the traditional 35-36mm. This, and cameras before it, are why I don't recommend lenses like the Nikkor 18-200mm. Those lenses are not great. They just have a very nice zoom range. Users who buy it usually say something along the lines of "This lens allows me to travel compact as it's the only lens I need". Well, then why not just get one of these? It's smaller and cheaper than the lens. You also get a whole nother camera out of it. Sure, a Nikon DSLR + Nikkor 18-200mm will take better pictures. But not by much. So, with winter comes a slow down in photos. (not helped by my lack of camera gear). Still, I managed to get out for a walk at lunch and snap some photos. I'm really impressed with the Nikkor 35mm f/1.4. This lens is from the day when lenses were crafted, not mass produced. 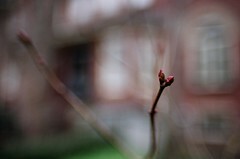 At close focusing distances, and wide open, this lens DOF is really shallow. Allowing you to create excellent subject isolation. it's field of view is just rite for a walk around lens on film. Speaking of film, I've gone to using the cheapest film I can find. Currently "Life Brand" film from Shoppers Drug Mart. Combined with $2.99 Processing to CD (no prints), it makes for an economical way to shoot film.